A man launched a "murderous attack" on a friend with screwdriver after he broke into his mother's home and robbed her, a court heard. Kevin Craig, 33, was jailed for six years and will be monitored for four years after his release. 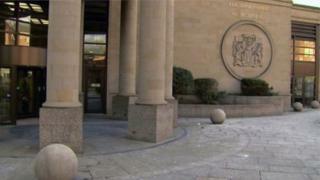 He admitted stabbing Michael Colquhoun six times at his home in Douglas, South Lanarkshire, in August. Craig confronted his victim about the robbery, which happened while his mother was home alone. Judge Lord Beckett told Craig: "You launched a murderous attack on Mr Colquhoun. "Whatever he may have done to you and your family provides no excuse. "I'm concerned to ensure the public is protected from you." Mr Colquhoun stole Craig's mother's medicine in the break-in. Mrs Craig who suffers from Chronic Obstructive Pulmonary Disease (COPD) was terrified and had to be hospitalised as a result of the robbery, the court heard. Craig admitted attempting to murder Mr Colquhoun by repeatedly stabbing him with a screwdriver. The court heard Craig, who was released on licence from Shotts Prison in July 2016, was angered at what his friend Mr Colquhoun had done. He was also enraged by the fact his offence was only dealt with by a fiscals' fine. Solicitor advocate Rhonda Anderson, representing Craig, told the court his mother was deeply affected by her ordeal. She told the court: "She was terrified and became very unwell and was taken to hospital. "The accused said he was being taunted by Mr Colquhoun by text and on Facebook saying 'I know you're on licence and can't do anything'." But about 16:10 on 12 August he entered Mr Colquhoun's house through the unlocked front door and challenged him to a fight. Prosecutor Duncan McPhie said: "The complainer refused and said the matter had been dealt with. "The accused then took a screwdriver out of his jacket pocket and repeatedly stabbed Mr Colquhoun, who screamed for Mr Craig to stop as he became aware he was bleeding heavily." After the attack Craig, who worked at a farmer's market, ran off. Mr Colquhoun suffered scars to his legs, left arm, back and buttock. Mr McPhie told the court one of the wounds was life threatening. Craig was previously jailed for seven years in 2012 for stabbing a neighbour twice in the back to the danger of his life.